A garden should be a healthy, beautiful part of our shared ecosystem. Our organic approach to landscape gardening will assure that your garden is vibrant, fruitful and balanced in every season. A well-managed landscape enhances the value of your home and offers endless enjoyment for years to come. Sustained, responsible upkeep ensures that the integrity of your landscape design is maintained as it matures, and regular gardening services represent a sizeable cost savings when compared to periodic clean-ups. We treat the problem, not the symptom! Our enthusiastic and knowledgeable team is also available for one-on-one garden coaching. Exteriorscapes offers a variety of plans—weekly, monthly, bi-monthly, and quarterly—to nurture and guide your garden. We care for all elements of your garden, including weeding and mulching, fine pruning and renovation, and pest diagnosis and management. We treat the problem, not the symptom! Our enthusiatic and knowledgeable team is also available for one-on-one garden coaching. 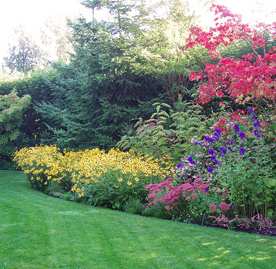 Exteriorscapes offers a variety of plans—weekly, monthly, bi-monthly, and quarterly—to nurture and guide your garden.